Although we’ve had a mild winter so far, I’m preparing myself for the snow (or ice) that’s sure to come our way when we least expect it. After all we did have 2 feet of snow in February last year! When we moved in, we had a random little wall just outside of the playroom and just on the other side of the desk area in our kitchen. It was the perfect place to put this table and chairs that a friend gave us. 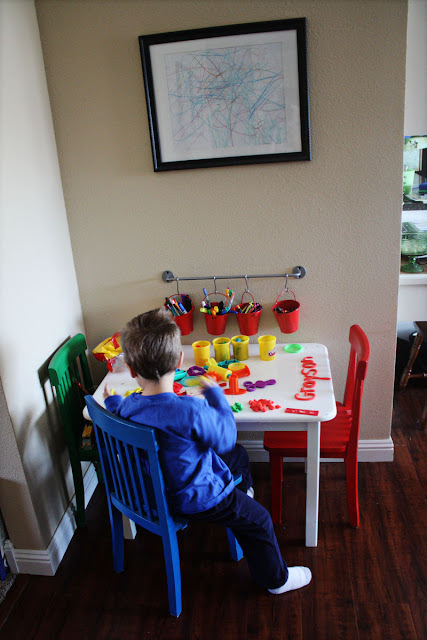 It’s definitely not the most “decorated” area of our house and it’s not going to earn any design accolades, but we strive to have a very kid-friendly home (after all, it is his home, too). This little art center has turned out to be one of my favorite places in the house, at least in terms of practicality. There’s no worry about cleaning up messy projects because the table sits on top of our laminate flooring. Play dough, paint, and other “messy” items clean up easily. To make it easier to reach the art supplies but keep them off the table, I hung a little towel bar (found at Ikea) and some little red pails from the Target Dollar Spot. We keep crayons and markers in these little buckets. I know it’s a little risky to keep these items out all of the time, but Grayson uses them as they are intended…not to color on the walls or furniture. If that’s an issue in your house, this might not be the best idea for you! But it works for us. It’s amazing how much this little space gets used, simply because the supplies are always out and at the ready. Here's a little photo of our art center in use. Do you have a spot in your home dedicated to crafting for your kiddos? Or is your kitchen table always ready for a little coloring or crafting session? Great art center, the kids will make many fantastic projects here. We have a customized picnic table with a chalkboard top and walled edges (so the legos stay on the table, not the floor) in our sons' room that sits atop laminate flooring and my only "issue" with the space is that they rarely use the chalboard due to the table housing the other supplies such as Legos, crayons, markers, drawing pencils, scissors and paper... I absolutely LOVE the towel bar idea! I'd have to customize it to fit much larger containers, but this is a great start! Thanks so much for sharing your ideas! Great way to organize all of those art supplies! Love your wall color, too! What is it? Thanks, Lori! The wall color is Monroe Bisque by Benjamin Moore. We used it in all of the "open" areas in our home and LOVE it! Oh goodness this is what I need in my house for my little one. We do everything at the kitchen table and so not ideal especially when we paint...lol.